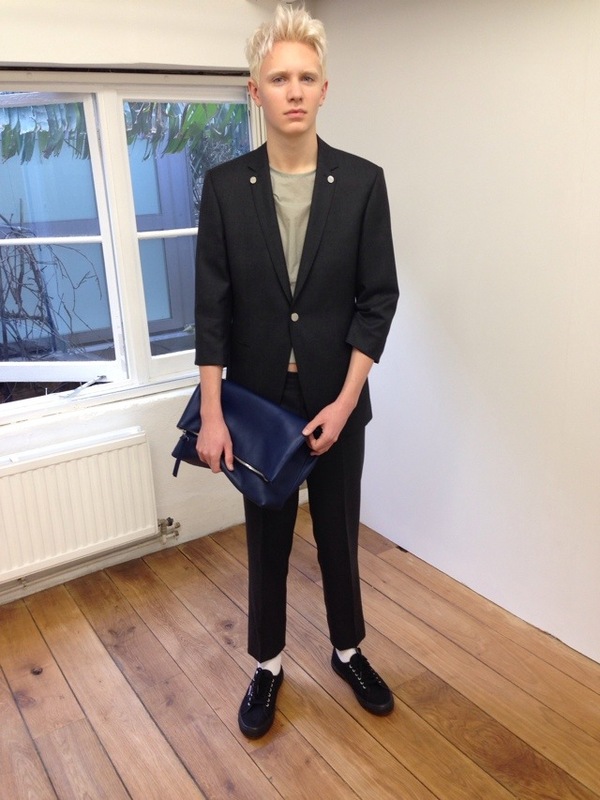 New label Pieter made its debut off-schedule today during these menswear shows in London. 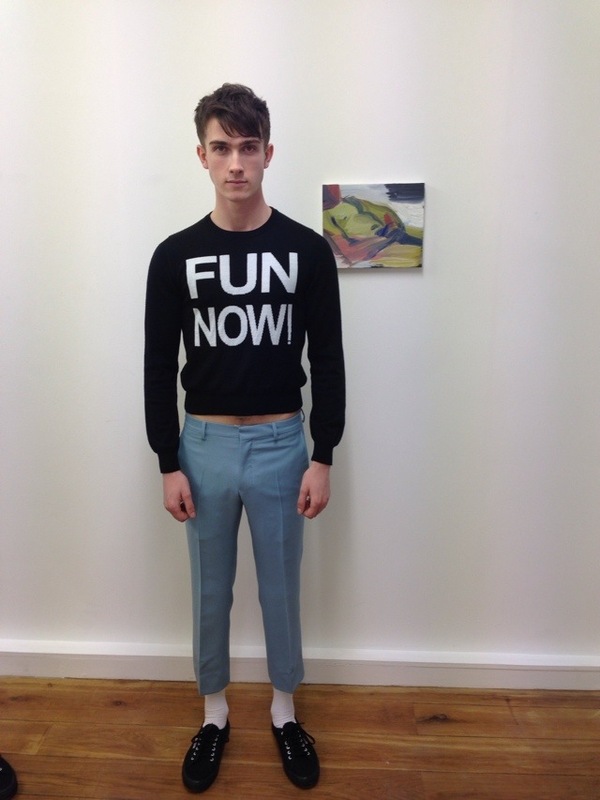 It’s the work of a young designer called Sebastiaan Groenen, who won the best collection prize at the 2012 LCF BA show. It was super, super good, about male sexuality, and the way that men interact with each other. Here’s a sweater with the slogan FUN NOW! on it, a phrase familiar to those on Grindr as meaning something else. That’s a Celia Hempton painting from her Chatroulette series on the wall – Pieter was at the gallery that shows Celia’s work – Southard Reid. 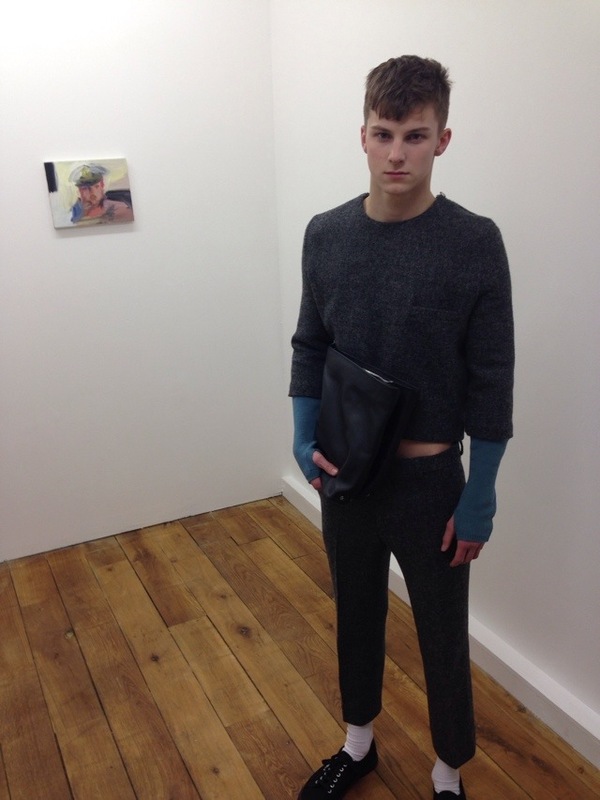 A cropped tweed look in front of another painting by Celia, of the same man, just a different um part of his body. Pieter is another label here in London playing with length. He wanted the work to be about concealment, but then what is revealed. And how clothing could be flirtatious at a time when men are hooking up on their phones rather than face to face. 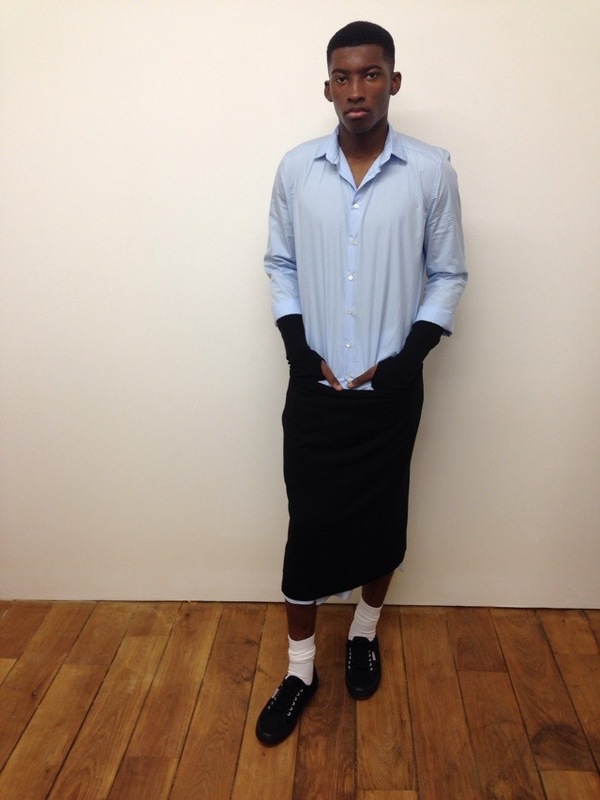 I love this guy in a sweater that has a drooped skirt attached. He somehow looks super butch. He’s in front of some AMAZING new pieces by Prem Sahib. There was also neat tailoring. 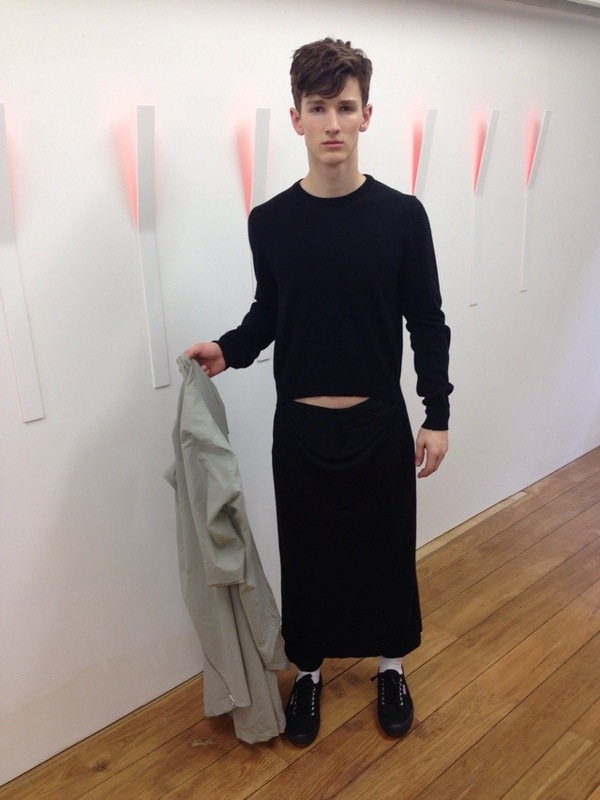 And this ace long shirt worn with a knit skirt. 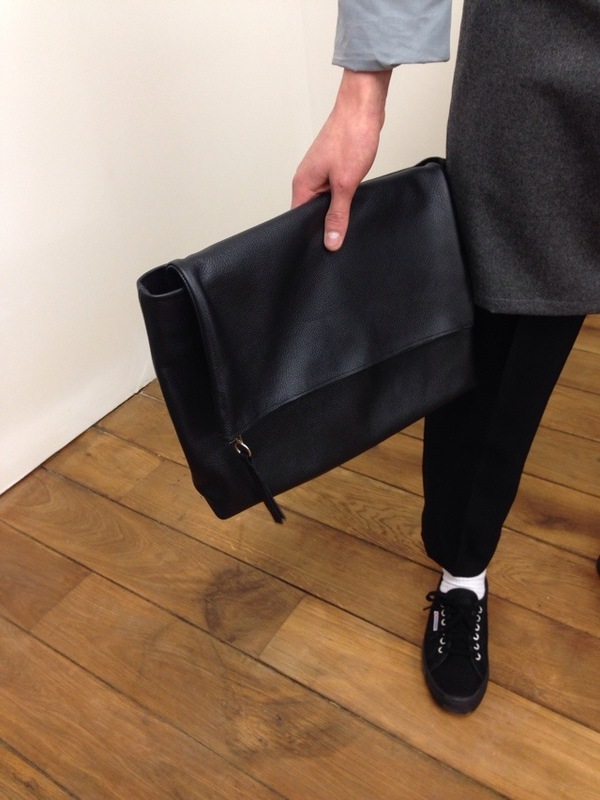 There were also bags, like this folded clutch. Super accomplished pieces for a debut collection. And such a clear, bold point of view.